This luxurious fresh fruit scented hand soap provides a rich, thick lather for a clean hand washing experience. The gentle and effective formula provides a thorough clean, but it is still gentle, so there is no need to worry about repeated hand washing causing dry hands. Each sanitary sealed refill comes with a fresh dispensing valve to help to lock out germs. 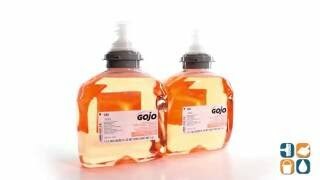 Gojo Premium Hand Soap is for use with a Gojo Touch-Free Dispenser (sold separately: GOJ 2730; GOJ 2740; GOJ 2789) and each refill snaps in place with a click so you know it is ready to go. 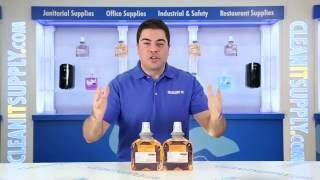 This Gojo Hand Soap is ideal for use in just about any location where there is frequent hand washing. Kills germs on hands while providing a rich, luxurious lather. Contains vitamin E and aloe. Fresh fruit fragrance.